Separate set of address, control and data bus to I/O and memory. 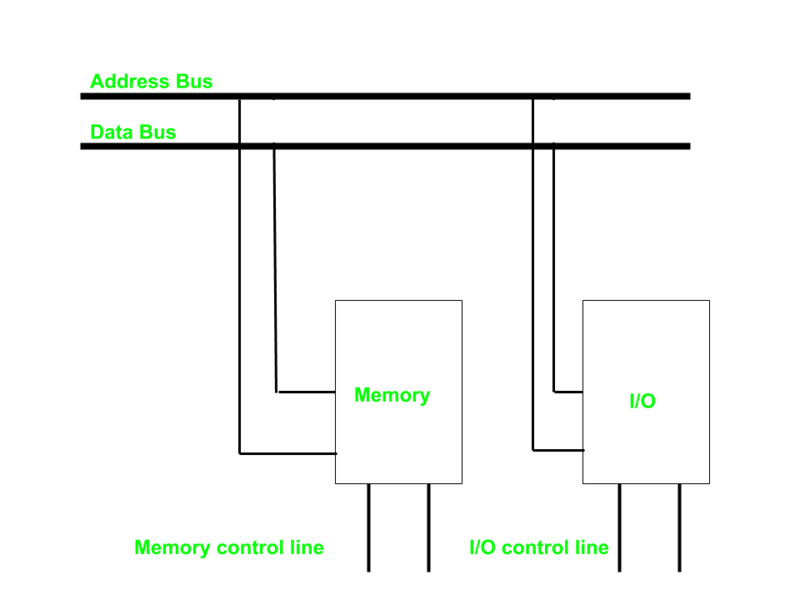 Have common bus (data and address) for I/O and memory but separate control lines. Have common bus (data, address, and control) for I/O and memory. In first case it is simple because both have different set of address space and instruction but require more buses. Then we have Isolated I/O in which we Have common bus(data and address) for I/O and memory but separate read and write control lines for I/O. So when CPU decode instruction then if data is for I/O then it places the address on the address line and set I/O read or write control line on due to which data transfer occurs between CPU and I/O. As the address space of memory and I/O is isolated and the name is so. The address for I/O here is called ports. Here we have different read-write instruction for both I/O and memory. In this case every bus in common due to which the same set of instructions work for memory and I/O. Hence we manipulate I/O same as memory and both have same address space, due to which addressing capability of memory become less because some part is occupied by the I/O. It is complex due to separate separate logic is used to control both. Simpler logic is used as I/O is also treated as memory only.